It’s a small thing but if you want to experience good service in France, it pays to remember how to say hello — use bonjour or bonsoir (after 6pm) — and merci (thank you) whenever you enter or exit a store. It’s a courtesy that goes a long way. If you’re not a fan of air kisses, you’ll be happy to know the French greet each other, personally and professionally, with a firm handshake. While exceptions are made for close friends and loved ones, on your trip, it’s best to introduce yourself, at least initially, with a firm handshake. 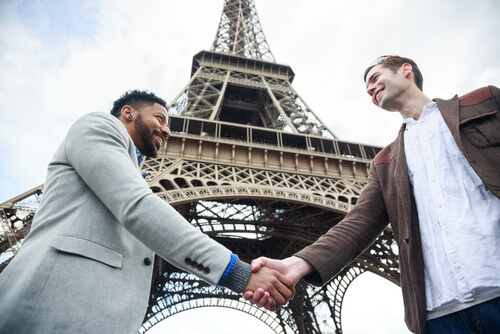 As if the language isn’t confusing enough, the French have formal (vous) and informal (tu) ways to say ‘you.’ Listen out for the words as a way to decipher if someone is referring to you (or anyone else) in a formal or informal manner. If all else fails, just know tu is reserved for close friends and loved ones. There’s no avoiding the air kiss and mastering it will impress the locals. Stick with dispensing just two kisses (it can go up to four in the north of France), start with the right cheek, aim to brush it with a kiss sound, and whatever you do, don’t ever end with a hug. At a bar, sure, but if you’re in a restaurant and stopping for a glass of wine, navigate away from the tablecloth-covered tables which are meant for customers sitting down for a meal only. Believe it or not, dining with your hands hidden is bad form. The French don’t mind if you keep your elbows on the table, for them, this is polite. Also, once you’re done, put your knife and fork parallel to the right of the plate so the waiter will know you’ve finished. Don’t rush through your meals, the French dine leisurely and at fixed times. Lunch is from 12pm-2pm and dinner only kicks off from 7.30pm. In-between you’ll have to make do with a snack or give in to a delicious viennoiseries (baked snacks from Vienna). Also, restaurant reservations are always advised, if you need help, ask the hotel concierge for assistance. It shouldn’t be a surprise that the Gauls have rules when it comes to dining. For instance, bread doesn’t belong on a plate, but beside it on the tablecloth, and preferably eaten along with the meal, not before. Salads are treated as palate cleansers and will be served after the main course to aid digestion. Cheese comes before dessert – when in doubt, opt for comté, Gruyère, goat’s cheese or a roquefort – and dessert and coffee are treated as two separate courses. To enjoy a sweet with your post meal espresso, order a café gourmand, an espresso served with three mini desserts. Hold back on the raucous laughter and bone-rattling chants when toasting in France, simply utter the word santé – to good health. Make sure you look at everyone in the eye and avoid crossing arms. In France, it’s common courtesy that cafes and restaurant won’t give you the bill unless you ask for it: l’addition, s’il vous plait. 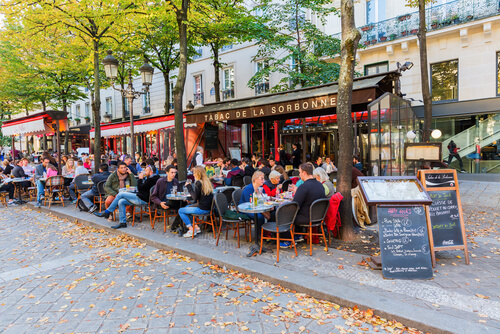 Unlike the US, tipping is not mandatory in France but it is encouraged for those who dispense services – opening doors, carrying your luggage, delivering room service – should be tipped €1-2 (A$1.50-3) each. Housekeeping can be tipped similarly, per day at the end of the trip, and if you’re taking a taxi, a 10% tip will do. When dining out, service and taxes are already included in prices but it never hurts to leave behind some change. If you’re invited to someone’s home, bring along a gift. The caveat? Bring something preferably French (wine, Champagne, cheese), otherwise flowers or a pre-agreed dessert. Take care not to arrive exactly on time, it’s perfectly acceptable to arrive 15 minutes late so the host has sufficient time to ensure everything is prepared. As tempting as it is to reach out and squeeze a melon, don’t. While shopping for produce in a market, let the shopkeeper know what you’re after. Simply point to the piece you’ve got your eye on, or allow him/her to choose for you. The French appreciate a smart dress sense, this doesn’t mean it has to be designer threads, just well-cut clothing in a quality fabric. While jeans are acceptable – you are on holiday after all – save the sporty clothes, tired sneakers and flip flops for the beach. Before you presume a café or boutique is open all day, 7 days a week, it pays to check. It’s not an uncommon practice for some shops to close between noon-2pm or have their own operating hours, many stores are also closed Sundays. If you’re determined to dine or shop somewhere in particular – especially in the summer months – check ahead. While ATMs and credit facilities are easily found in France, for smaller purchases storekeepers or market vendors will prefer you pay with cash. It’s not uncommon for a certain minimum charge before a credit card is accepted, too, so keep some spare Euros handy.